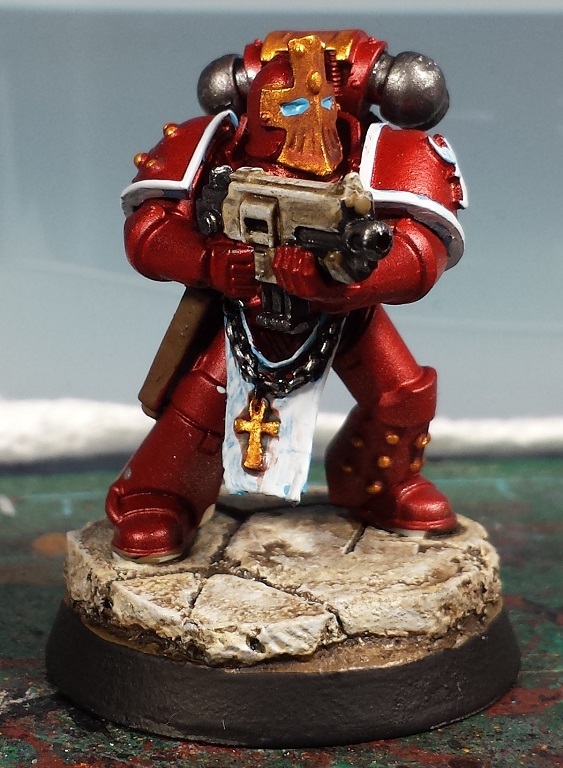 Mordian 7th Regiment: Heresy Era Thousand Sons - Sekhmet Terminators built, and a test model! Heresy Era Thousand Sons - Sekhmet Terminators built, and a test model! Been a very busy week at work so not as much hobby time overall as I'd hoped, but I did manage to spend a few evenings gluing my fingers together and banged together the first five models for the two Sekhmet Terminator squads! In the newly-released book from FW, one of the bespoke Thousand Sons units are the Sekhmet Terminators, bodyguards to the legion commanders and powerful psykers in their own right. First up are the five combi-plasma-toting Tartaros variants - They aren't allowed to have any heavy weapons, but I figured a bit of plasma is the next best thing! Interestingly the sergeant doesn't really get much in the way of wargear to differentiate him from the squad, so I'm planning on doing an alternately-colored helmet on one of 'em to mark him out. The Sekhmet are also given the option of taking Cataphractii armor as well, and as I had some extra bits left over from the previous project, five of them ended up getting built as well. I utilized the unused combi-bolters from the Tartaros set, as well as a few leftover heads on 'em which I rather like the look of! This unit is going to be a tank-hunter team with a mess of Chainfists - My favorite terminator weapon by far. While I was about it I pulled out a few models that never quite gelled in the previous force, the counts-as Skyhunter Jetbikes, in the guise of some techno-chariots (which all too soon will undoubtedly become full-blown disc-riders). The chariots were more or less done but I never got around to building riders - easily rectified, or so I thought! It was at this point I realized I ran out of heads for the power armoured blokes - Luckily I'm placing an order for the new book this weekend, so there will undoubtedly be a few other resin goodies making their way into the cart (much to my wallet's dismay no doubt)! Been fiddling around with test models to try out some color schemes recently as well. I'm rather enamored of the metallic red that FW has been showing off of late and wanted to give it a shot with this force. Still dialing in the scheme but I'm reasonably happy with the way this one turned out. I need to do a bit more on the pin-washing front to give the armour a little more depth. It's pretty sloppy as this is just a leftover test model I'd thrown some paint at, but overall I'm kinda digging how it's looking! Feels good to be working on my favorite Legion once again! Those Techno Chariots look pretty cool, I can't remember seeing them before, great use of superglue caps! But, I know what you mean on the test model. Is the paintscheme lacking some depth on the metallic red bits because it's brushed on? 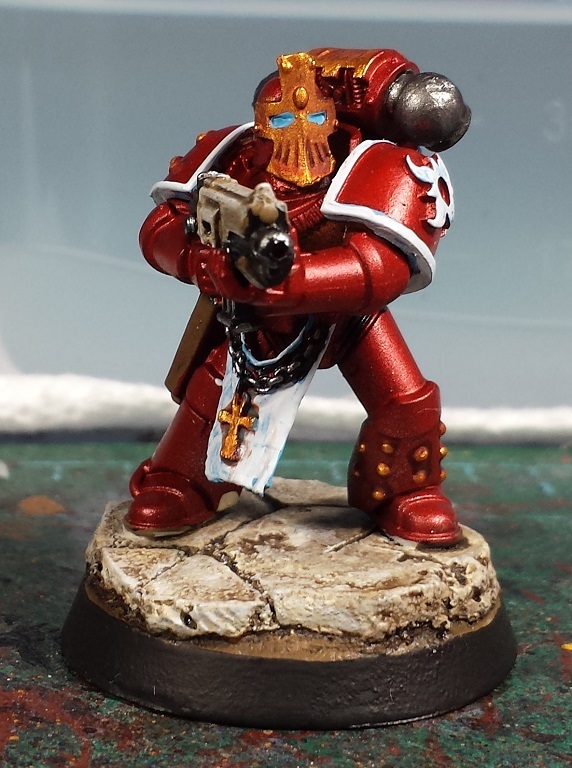 Easier to pre-shade with airbrush, maybe some pre-shading needed, or is the red too thick? It's not looking metallic enough? Anyway, I remember Lady Asia at Battle Bunnies doing a sweet Brass Scorpion with metallic reds, hopefully this gives some pointers? I think that red and gold scheme will look amazing on a large force! Wheres the spreadsheet man? We all love the spreadsheet!! Nice progress, How are you getting the red? It's a really nice shade. Will you brush or air brush? I'm just looking for a nice couple of golds for the pre shade before I crack on with mine. Are you making your own metallic with metallic medium? Looking good buddy! Glad to see you back at it and breaking out the chariots again. Also any chance your closet of doom has a tomb kings sphinx I could purchase? I've pre ordered the book. Another ~£100. Oh well. @Siph_Horridus: Aye, a little more depth is needed - going to be adding some pin washes, and testing out a couple other recipies. It's all very experimental so far! @Riot Ville: Haha! Will do! @Col. Hertford: Trying some airbrushing ideas for the moment. So far so good! @Francesc: Thanks! They've been fun so far! @Rory Priest: Thanks man! I always wanted to get back to them, the upcoming force is planned to be a bit more mobile than the last, so the jetbikes should fit nicely! Sadly no Tomb Kings sphinx in the CoD, I wish I did! There's some cool bits that I'd like to use. @Zzzzzz: Hah! I wish I got off that easy - it was almost £600 by the time I came to my senses. Luckily the previous iteration of the KSons sold, so it wasn't as painful... Heh. Glad the other lot sold for you. Nice man.. the builds look awesome. I need to get to work on putting some more peeps together as well but the glue fumes have been killing me lately! @Rory Priest: Thanks man, it was a bit of a nailbiter but someone came through on 'em! @Todd Sherman: Hah! I hear that, been beavering away behind the scenes building and the resin dust and glue fumes can get unpleasant! @Greg Hess: Absolutely! I'll usually mask up whenever I break out the dremel for resin work, and have a fan blowing fumes away from me when gluing.